A daily (or weekly) workout may be part of your health routine for your body and you are probably already seeing the results. Firmer glutes, thighs and tummy. What about your face? Did you realise that your face can benefit from a god workout and you can prevent the premature appearance of wrinkles. Take a look at our daily facial exercises and you will learn how to slow down the signs of aging and especially prevent the appearance of wrinkles on your face. The very first place on your body to show the damage caused by the passing of time is your face. It is also the first thing that people notice about us. You can wear great clothes and shoes, have the most expensive hairstyle and tone up your body, but with a wrinkly face, these will not do much to portray a youthful appearance. You must give your face the care it needs. To do so, you should follow a healthy diet that is packed with a wide variety of fruits and vegetables. It is also important that you always drink plenty of water. Likewise, you should try to maintain good, healthy lifestyle habits. Take some moderate exercise, sleep well and avoid a lot of alcohol. It is also important that you don’t smoke. The single most aging element of our environment is cigarette smoke. Give it up today! Stress is a serious wrinkle-generator as well! Use techniques like yoga and mediation to reduce your stress levels. It is tempting to pile on the makeup when you first notice the appearance of wrinkles, but this is unlikely to help. Instead, adopt a simple skin care routine that involves cleansing, toning and moisturising. Always take off your makeup at night. Choose a light foundation that suits your skin type and apply it sparingly. Choose make up with a high sun protection factor – over-exposure to the sun causes deep and premature aging that cannot be reversed. There are a lot of anti-wrinkle treatments in the market, which are undoubtedly very effective, yet also expensive. For this reason, we will recommend some exercises to tone your face in this article that are just as effective at fighting wrinkles on your face and don’t cost a penny. You just need to spend a few minutes a day to do them and that’s it. It’s super easy! Stand in front of a mirror after showering and try to move all of your facial muscles for at least ten minutes. If possible, you can also do this right before going to sleep. Look up as high as possible, then to the right and to the left. You should do four series of twenty repetitions each, resting for two minutes between each series. A very easy exercise is to close your mouth tight and blow so that your mouth fills with air. You should also move your tongue from right to left. Do three series of fifteen or twenty repetitions. Open your mouth as wide as possible and cover your teeth with your lips. Stay like this while you count to ten and then close your mouth very slowly. Relax your muscles before starting again. Do five repetitions. 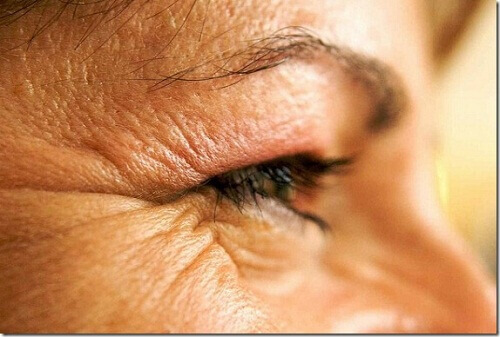 With the tips of your fingers, squeeze and press on the wrinkles in this area, making upward and downward movements. Facial massages have the same results, because they act on your tissues, helping correct damage caused to your skin. You can do these massages in the places where the wrinkles appear more frequently. You can do the facial massages for ten minutes in the morning and afternoon. If possible, a few drops of sweet almond oil can help, which will also hydrate and moisturise the skin. Before doing any of these facial exercises, it is very important to apply cream to your entire face to stimulate and prepare your skin. As a result, the exercises you do will be much more effective.